The 2019 Ford Fusion is one of the most uniquely stylish sedans in the segment. 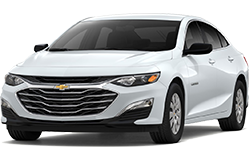 Many competing vehicles like the 2019 Chevy Malibu try a little too hard to be stylish and end up with unattractive designs. With the 2019 Ford Fusion, Ford managed to create a sleek sedan that spices up its design with a hint of sportiness. The new Ford Fusion also has numerous exterior features that are both practical and stylish. One of the most useful standard exterior features on the 2019 Ford Fusion is the rain-sensing wiper design, which is absent in the 2019 Chevy Malibu. The Ford Fusion also has standard tinted windows that look great and provide an atmosphere of privacy and discretion. The 2019 Ford Fusion even includes a standard rear defrost feature, which will certainly come in handy on those cold Wilkes-Barre winter mornings. Come into the premier Wilkes-Barre car dealership, Coccia Ford, to take a look at the 2019 Ford Fusion. Schedule Your Test Drive at our dealership in Wilkes-Barre today. The cabin of the 2019 Ford Fusion is every bit as stylish and well-equipped as the exterior of the vehicle. In contrast, the 2019 Chevy Malibu's interior is just as awkward and bare of features as the exterior. Ford's new lineup of vehicles has been praised for its attractive interior design, and the 2019 Ford Fusion shows that a sedan doesn't have to be expensive to have a pleasant interior. The Ford Fusion includes standard cloth seats with driver lumbar support. Another standard feature included in the 2019 Ford Fusion's cabin that is absent in the 2019 Chevy Malibu is an electrochromic rearview mirror. The 2019 Ford Fusion also has a pass-through rear seat, which effectively expands the cargo space in the trunk. If you're looking into used cars, Wilkes-Barre-area dealership Coccia Ford has an affordable new vehicle you may be interested in instead – the 2019 Ford Fusion. Test-drive your new dream car at our dealership in Wilkes-Barre today. The 2019 Chevy Malibu can't come close to matching this list of driver aids. Drivers searching for a safe family sedan at a Wilkes-Barre car dealership can find the new Ford Fusion at Coccia Ford. Make an appointment through our website for a test drive at our dealership in Wilkes-Barre. 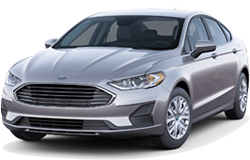 The 2019 Ford Fusion offers spirited performance, making even commuting or running errands fun. Many vehicles in the segment, such as the 2019 Chevy Malibu, offer the sort of dreary driving dynamics that drivers in the market for an affordable sedan may have come to expect. The 2019 Ford Fusion, on the other hand, is engineered to exceed expectations. The standard 2.5L 4-cylinder engine in the new Ford Fusion makes 175 horsepower, considerably more than the 160 horsepower that the 4-cylinder engine in the Chevy Malibu produces. The engine in the 2019 Ford Fusion is paired with a 6-speed automatic transmission that maximizes efficiency. The standard front-wheel drive system in the Ford Fusion provides an exceptionally stable ride for enhanced safety. Considering the lackluster performance of many used cars, Wilkes-Barre drivers would be better suited to driving the 2019 Ford Fusion. Take a test drive at the Coccia Ford dealership in Wilkes-Barre today. The 2019 Ford Fusion is full of technology that is easy to use and powerful. The centerpiece of the tech in the 2019 Ford Fusion is the SYNC® voice recognition system, which competitors like the Chevy Malibu just can't match. The Ford Fusion also has simple and convenient technology like its standard auxiliary input. The 2019 Ford Fusion even offers an optional voice-activated GPS system. Drivers in Philadelphia, Scranton, and elsewhere in the Wilkes-Barre, PA area can try out the tech features in the 2019 Ford Fusion at the Coccia Ford dealership in Wilkes-Barre today. Our Ford dealership offers a large inventory of New Ford Models and Used Cars, with exceptional special offers!